Bloubergrant is generally regarded as the area in Blaauwberg between the Beachfront and the R27 West Coast Road . It is a sizeable area, containing some of the most sought after property in Cape Town . Properties in Bloubergrant generally enjoy the spectacular view of Table Mountain , a view that has made this part of Cape Town famous and sought after property destination. Property in Bloubergrant is in the upper price brackets and prices start at +/-R1 500 000. Property in Bloubergrant is an extremely good investment and has shown excellent growth and returns. The infrastructure is superb, with well laid roads and easy access to major thoroughfares. The beachfront of Bloubergrant is rapidly changing, with new developments being built at a furious pace. The area has a well established Primary School, Bloubergridge Primary School , as well as a number of crèches and other educational institutions. A map of the area can be found by clicking here . Bloubergrant is home to the heartbeat of the Blaauwberg area as it relates to entertainment and restaurants. The area around Marine Circle has a number of fine restaurants, pubs, take away establishments, shops and other facilities. In the summer months, the beaches are well used. 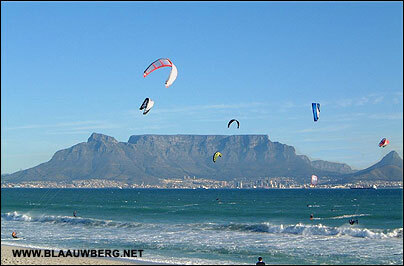 The sight of 100s of kite surfers enjoying their extreme sport at Kite Beach is definitely a sight to behold. Looking for property to buy or rent in Bloubergrant or wanting to sell property in Bloubergrant? Type the code you see in the image in the box below.